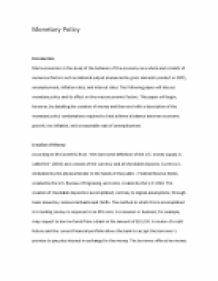 This paper will begin by detailing the creation of money and then end with a description of the monetary policy combinations required to best achieve a balance between economic growth, low inflation, and a reasonable rate of unemployment. ﻿Monetary Policy Introduction Macroeconomics is the study of the behavior of the economy as a whole and consists of numerous factors such as national output (measured by gross domestic product or GDP), unemployment, inflation rates, and interest rates. The following paper will discuss monetary policy and its effect on the macroeconomic factors. 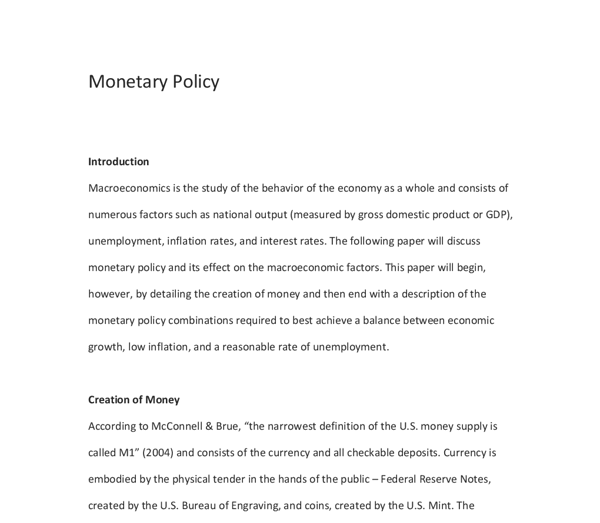 This paper will begin, however, by detailing the creation of money and then end with a description of the monetary policy combinations required to best achieve a balance between economic growth, low inflation, and a reasonable rate of unemployment. Creation of Money According to McConnell & Brue, ?the narrowest definition of the U.S. money supply is called M1? (2004) and consists of the currency and all checkable deposits. Currency is embodied by the physical tender in the hands of the public ? Federal Reserve Notes, created by the U.S. Bureau of Engraving, and coins, created by the U.S. Mint. The creation of checkable deposits is accomplished, contrary to logical assumptions, through loans issued by commercial banks and thrifts. The method in which this is accomplished is in lending money in response to an IOU note. A consumer or business, for example, may request to borrow funds from a bank in the amount of $10,000. ...read more. This leaves the bank $10,000 in excess reserves that may be used for lending purposes. Manipulation of this ratio has a direct effect on a bank?s ability to lend. A rise in the required reserve ratio would translate to reduced excess funds in the reserve and, in turn, reduced availability of funds to lend. The opposite is true; a drop in the required reserve ratio would translate to increased excess funds and, therefore, greater available funds for lending. If the ratio were raised to 20% in the scenario above, the bank would be required to hold $20,000, matching what it currently holds in reserve. This bank no longer has excess funds and is unable to lend. If the ratio were lowered to 5% in the scenario above, the bank would be required to hold $5,000, increasing the reserve excess to $15,000 and increasing this bank?s ability to lend. The influence of the Required Reserve Ratio is on the availability of money in the system. The effects of manipulation of this ratio are identical to the manipulation of the Discount Rate. A drop in the ratio immediately adds to the money supply and has the effects of increasing aggregate demand, output, and employment. ...read more. This describes the reason an increase in money supply increases the inflation rate. Moneychimp.com defines the unemployment rate as the ?percentage of employable people actively seeking work, out of the total number of employable people? (2008). This rate is actually indirectly related to the money supply since it is directly related to the GDP. An increase in spending and investments spurs increased demand, as described earlier. As such, output may be raised to supply that demand through a larger workforce; hence, an increase in money supply will serve to increase GDP which will, in turn, reduce the unemployment rate. The Best Monetary Policy Unfortunately, there is no ?best policy? when it comes to maintaining continued economic growth, control on inflation, and low unemployment rates. Many outside forces contribute to these macroeconomic factors as may be witnessed in the Monetary Policy simulation found in the University of Phoenix rEsource. Each tool the Federal Reserve employs in efforts to achieve economic harmony have varied levels of effect and can be greatly influenced by outside forces, such as foreign production or prices. The best monetary policy that may be employed in such a situation is a dynamic policy, one capable of being changed the moment a new factor is introduced to the equation. ...read more. These are examples of how aggregate demand can be manipulated through fiscal policy. Wage controls can be imposed by the government in order to reduce inflation. A wage control is simply a measure put in place by a government to protect employers and employees. As inflation can disrupt businesses planning due to the uncertainty on what will happen in the next few months, planned investment spending is reduced. Lower investment has a detrimental effect on the economy long run growth potential. Unemployment can also occur as a result of a worsening in the balance of payments deficit. If British goods become more expensive then fewer people abroad would purchase them. The other side of this is that British people would also purchase more foreign-made goods. But also those who have been unemployed for longer will be less motivated to get a job, also the youth that is unemployed will join this group of people that are going to be socially excluded. After all the work place is more than only working, it is also an interaction between people. and transaction (T) are generally assumed to be constant by the monetarists, for the equation to be same on both sides, then increase in money supply on the left hand side will lead to greater rate of inflation on the right hand side. for: * Healthcare * Education * Technical Education * Agriculture * Irrigation * Hydel Power Generation * Agriculture Research * Housing and Construction, Etc. CHALLENGES FOR THE FEDRAL BUDGET 2004-05 The budget for 2004-05 plans to address some very pressing challenges and take measures to overcome them. Changes in Fiscal Policy Fiscal Policy refers to changes in government spending, welfare benefits and taxation, and the amount that the government borrows For example, the Government may increase its expenditure e.g. financed by a higher budget deficit, - this directly increases AD Income tax affects disposable income e.g.